In any case, you’ll appreciate the further allusion in having the GR as a boatman, evoking Charon, the ferryman of Hades. 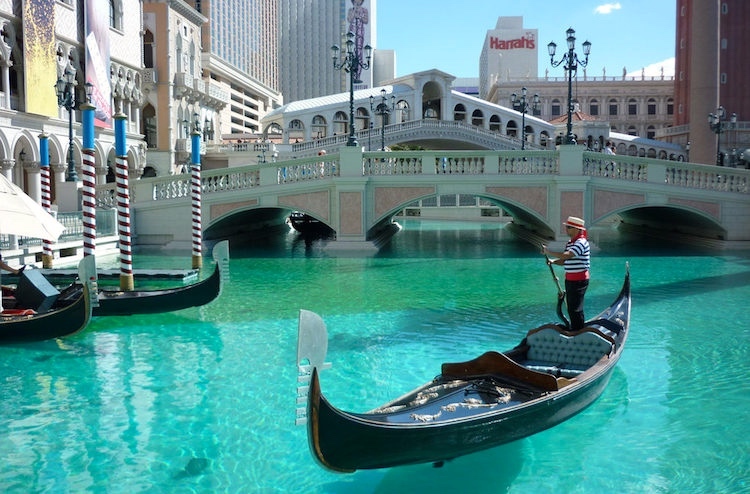 The gondola … is a traditional, flat-bottomed Venetian rowing boat, well suited to the conditions of the Venetian lagoon. It is similar to a canoe, except it is narrower. It is propelled by a gondolier, who uses a rowing oar, which is not fastened to the hull, in a sculling manner and acts as the rudder. … Every detail of the gondola has its own symbolism. 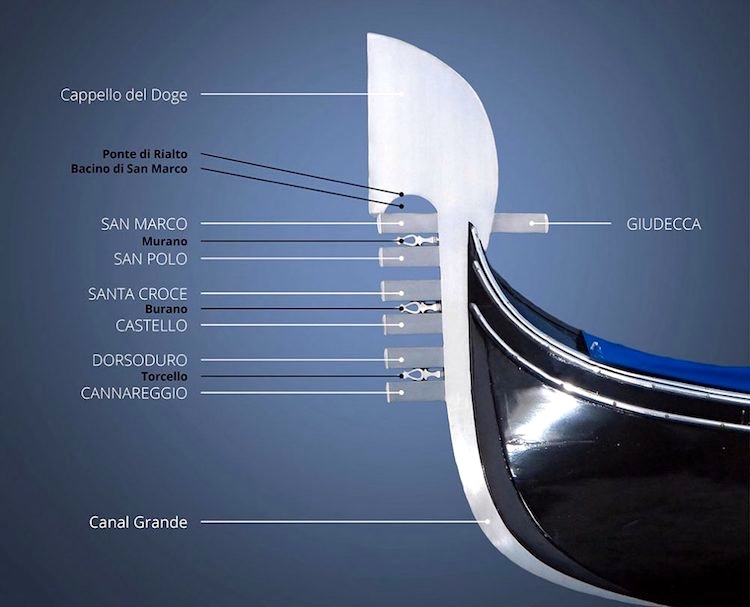 The iron prow-head of the gondola, called “fero da prorà” [or “ferro di prua”, depending on the variety of Italian: the ‘grapnel at the prow/bow’] or “dolfin”, is needed to balance the weight of the gondolier at the stern and has an “Ƨ” shape symbolic of the twists in the Canal Grande. Under the main blade there is a kind of comb with six teeth or prongs (“rebbi”) pointing forward standing for the six districts or “sestieri” of Venice. A kind of tooth juts out backwards toward the centre of the gondola symbolises the island of Giudecca. The curved top signifies the Doge’s cap. The semi-circular break between the curved top and the six teeth is said to represent the Rialto Bridge. Sometimes three friezes can be seen in-between the six prongs, indicating the three main islands of the city: Murano, Burano and Torcello. “In all the world there is no impurity so impure as old age. In Greek mythology, Charon or Kharon … is the ferryman of Hades who carries souls of the newly deceased across the rivers Styx and Acheron that divided the world of the living from the world of the dead. 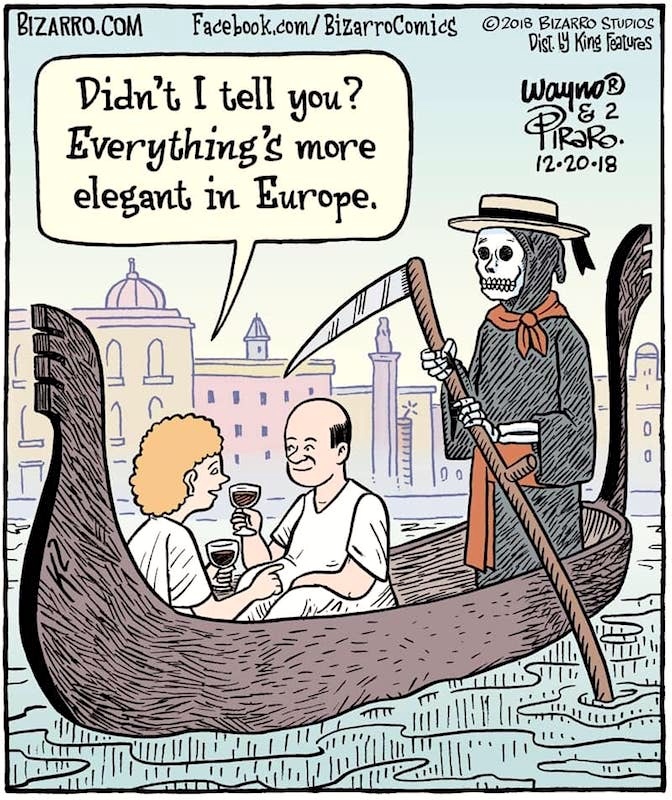 Everything’s more elegant in Europe, even that final voyage to the underworld. 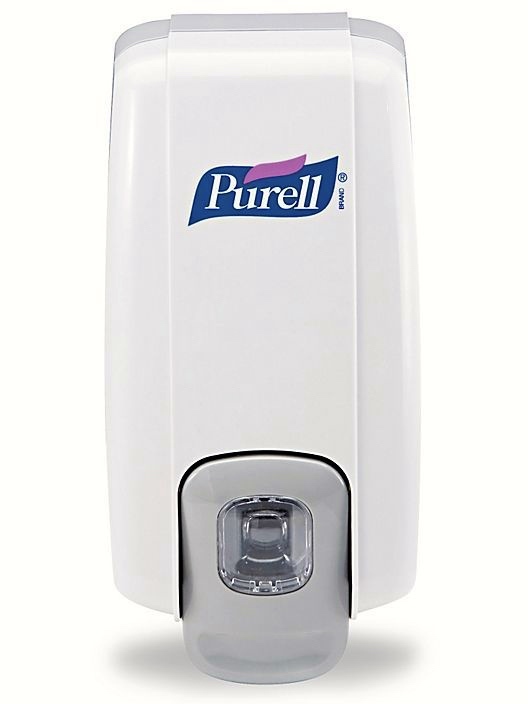 Purell is an instant hand sanitizer made of ethyl alcohol which claims to kill 99.99% of common germs that may cause illness in as little as 15 seconds. [Yes, there’s an entertaining attachment ambiguity in that sentence.] Its active ingredient is ethanol (70% w/w). It is used by wetting one’s hands thoroughly with the product, then briskly rubbing one’s hands together until dry. 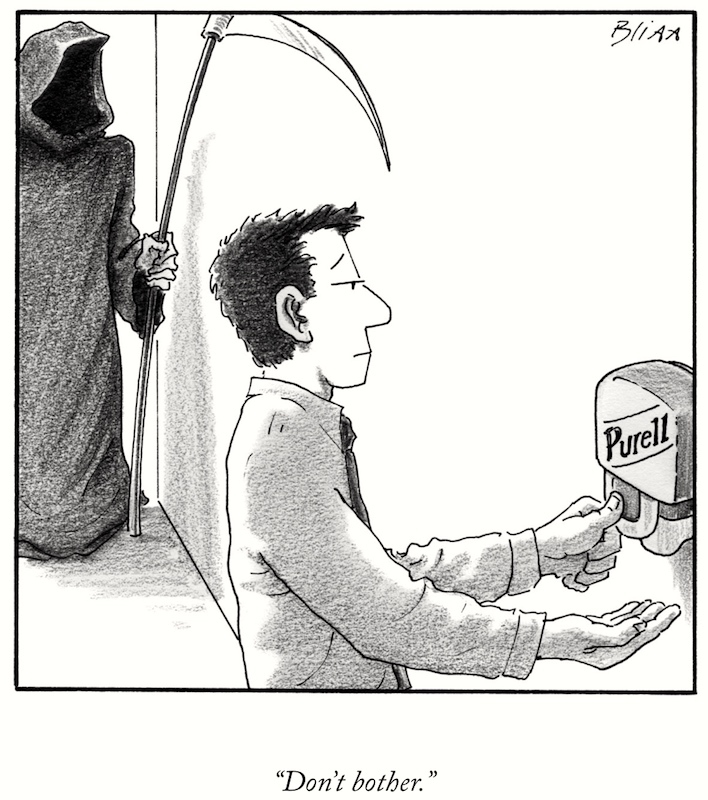 … Purell was introduced to the market in 1996. In #2, it’s too late for Purell to be of any help in warding off illness. This entry was posted on December 20, 2018 at 5:55 pm and is filed under Books, Comic conventions, Linguistics in the comics, Modifier attachment, Movies and tv, Understanding comics. You can follow any responses to this entry through the RSS 2.0 feed. You can leave a response, or trackback from your own site.